Clumber Spaniel Temperament (Loyal, Affectionate): Who Couldn't Love This Dog? Clumber Spaniel Temperament (Loyal, Affectionate): Who Couldn’t Love This Dog? The Clumber Spaniel temperament makes him a kind-hearted mush. He has the hunting instincts of a Spaniel, but the sweeter, calmer personality that is often seen in older dogs. Here are the six dominant traits of the Clumber Spaniel temperament. While every dog is an individual, these traits seem to be the same across the breed. The Clumber Spaniel loves showing his family that he loves them. He can be more reserved with strangers, but this is not a dog that resorts to aggression or even timidity. However, they do tend to be more reserved than other Spaniels. The Clumber Spaniel is so calm and easygoing that he makes for the perfect choice for someone who has never owned a dog before. While he may be a hunter at heart, when he’s in for the night he is quiet and calm. He puts the “retire” in the phrase “retire for the night” – only to get right back to it again when morning comes. The Clumber Spaniel is both dignified and mellow. He has the kind of demeanor that you would expect from one of those old, respectable dogs in family films. What’s funny is that he never really appears to age. The Clumber Spaniel is young at heart well into and beyond his twilight years. He may appear to be goofy, but he’s actually rather intelligent. Don’t let his big doe eyes fool you. However, the dignified side of his personality may not kick in until he’s around four years old. This is because he’s still a puppy until he’s around three or four – and he will tear up and wreck your house as any other puppy would. The Clumber Spaniel is great with anyone and anything – including children, other dogs, and even cats! Okay, well maybe not anything – if he sees a small furry or feathered outdoor creature in the yard, his hunting instinct will kick in, and he will go after it. So perhaps those animals would disagree that the Clumber Spaniel isn’t gentle as far as they’re concerned! This is the kind of dog that will lumber through your flower patch and then look back as if to say, oops, sorry. 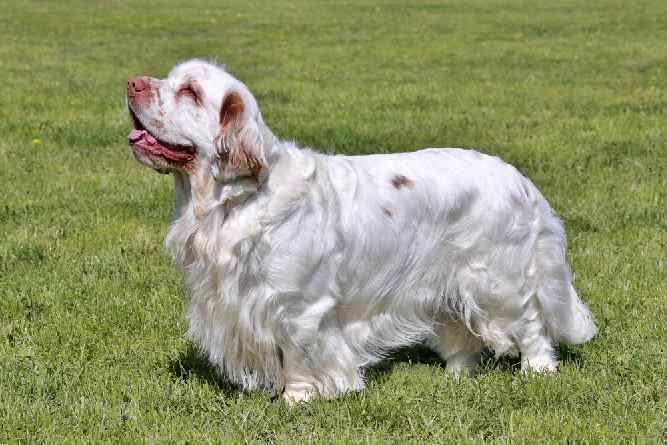 The Clumber Spaniel is loyal to his family and would do anything for them. The “Spaniel” in the Clumber Spaniel’s blood is what inspires him to be such a courageous dog. He loves a sense of adventure, and his level of excitement may be surprising, considering his otherwise goofy and clunky nature. Interestingly, the history of the Clumber Spaniel is largely unknown. The legend goes that Clumber Spaniels originated in France and that smugglers brought them to England during the French Revolution. However, there is no evidence that this is true. So, no one really knows for sure where the Clumber Spaniel came from. What we do know, though, is that he gets his name from Clumber Park, a large estate located in England that once belonged to the Duke of Newcastle. Training the Clumber Spaniel can feel like a bit of a chore at times. This is because he needs to stop and think things over first before he takes any action. This is perhaps better than diving into the deep end with both feet, but it can be taxing on any trainer. Don’t lose your patience, though. He won’t do well with harsh scolding or spanking. Hold his attention by keeping your training session fun. If he loses interest, then he’ll just mosey on to something else to do. It may feel silly at first but explaining to him why he needs to do what you are training him to do can actually help his response rate. Also, when it comes to barking, some Clumber Spaniels are quiet, while others are Chatty Cathys. And they pick up habits from those with whom they live. So if you have a yappy little Terrier, the Clumber Spaniel will, in time, learn to exercise his vocal cords a lot more. You can train him out of this, though, by teaching him when it is and is not an appropriate time to bark. Perhaps just as important as taking care of his coat is taking care of his ears. You must regularly clean his ears to help prevent infection. Clean the wrinkles on his head with a damp cloth regularly to prevent yeast infections. If he’s not working in the fields all day, then a once-a-month bath is sufficient. Else, you will need to bathe him more often. You don’t need to trim his coat much. Just brush and comb him once or twice a week to keep it looking healthy and clean. Despite his clumsy gait, the Clumber Spaniel is actually surprisingly active. He loves a long walk (20 to 30 minutes) twice a day, especially if you let him take breaks now and then to sniff around. He also enjoys retrieving, so if there are days you’d rather play fetch with him in the backyard then go for a walk, he’s totally fine with it. 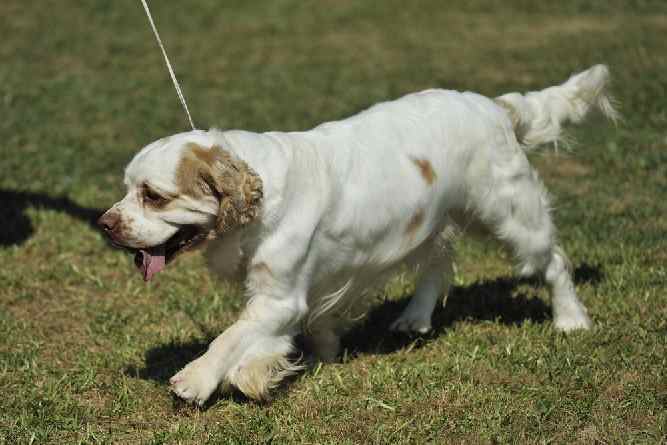 The average Clumber Spaniel size is between 18 and 20 inches for a male, and 17 and 19 inches for a female. The average Clumber Spaniel weight is between 70 and 85 lbs. for a male and 55 and 70 lbs. for a female. This makes the Clumber Spaniel more of a mid-size dog, but a hefty one at that. 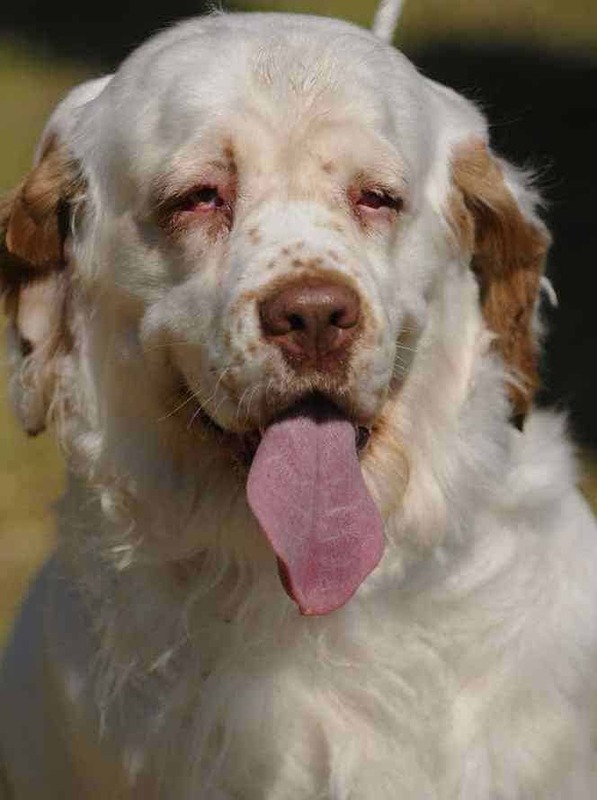 The Clumber Spaniel's life expectancy is between 10 and 12 years. Note: Few things are more important than our Health. It's no different with our Dogs Health. Some visits (and Money) to your Vet can be avoided if only you know what to do when your dog is ill. The Ultimate Guide to Dog Health is the answer. No dog owner should be without this handy guide. It's no substitute for your Vet but it will Save you Money. And help you quickly understand and recognize symptoms before they become a serious problem for your dog. Interested in adding a Clumber Spaniel puppy to your family? Congratulations! You can find a Clumber Spaniel for sale either through a breeder or a rescue organization or adoption agency. The average Clumber Spaniel price is between $800 and $1,200. The Clumber Spaniel cost all depends on the breeder you choose and the family tree of the dog you are interested in. For instance, if the puppy you’re eyeing is the offspring of a show dog, expect to pay more for that puppy. If you want to adopt a Clumber Spaniel puppy, you can find one through a local rescue organization or adoption center. Clumber Spaniel rescue dogs will always cost less than a dog that you buy from a breeder. 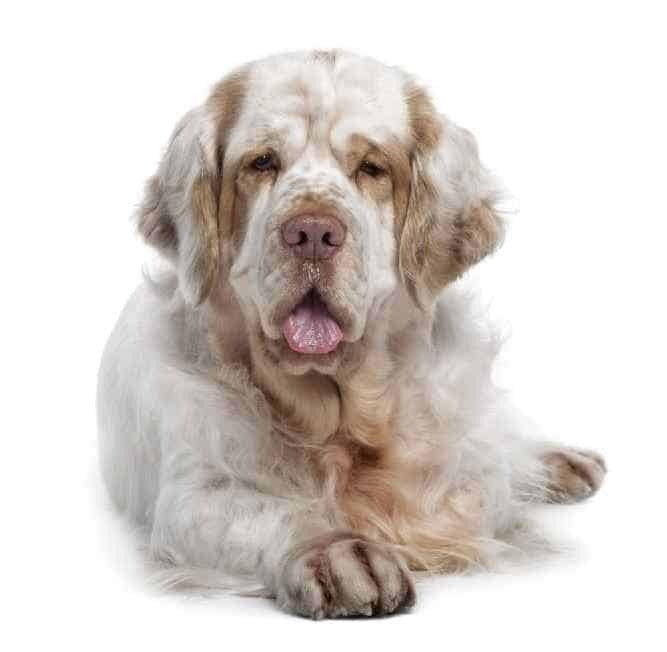 If you would like to purchase a Clumber Spaniel mix, then adoption is the way to go. More people will give up a “mutt” than a purebred they spent serious money on. If you live in Florida, there are actually a number of Clumber Spaniel rescue Florida groups you can check out. 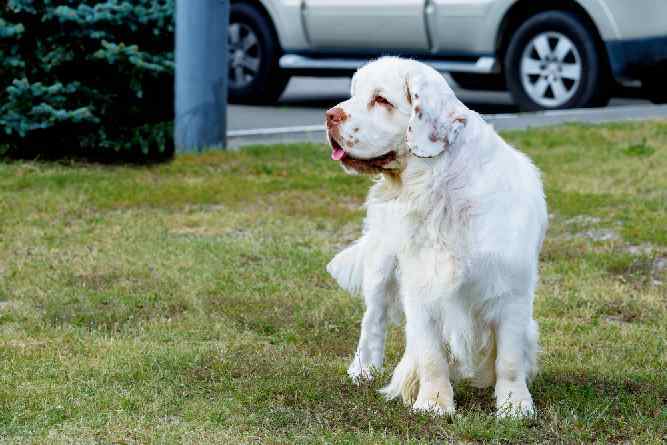 The Clumber Spaniel Club of America is helpful if you want to buy a dog from a breeder, but you aren’t sure of the process. In addition to a Puppy Buyer’s Guide, the site also hosts a breeder referral page, where you can choose from a list of several breeders located throughout the country. Conclusion: Why the Clumber Spaniel Dog? How could you not love the Clumber Spaniel? The Clumber Spaniel temperament makes him a joyful presence to be around. If you’re looking for a dog who can be more of a watchdog or guard dog, then this is definitely not the dog for you. While the Clumber Spaniel may act more reserved when he meets someone new, he never resorts to aggression or acting shy. He’s easy to take care of, too. The most important thing to remember is to keep his ears and the wrinkles in his head clean. Regularly maintaining both his ears and his head works to ward off any potential infections. Previous post: Belgian Sheepdog Temperament (Intelligent, Active): Are You Up for the Challenge?